EES have reported a few times on pirates. When they’ve attacked near Singapore, and also when there was multiple attacks in November 2013. There are way too many incidents that occur that we do not report on. Most of us have seen the Captain Phillips movie by now, and if you haven’t seen it, you must make time to watch this riveting story. Modern day pirates are not something that is often talked about, but quite often you will receive an invoice with a charge that will be titled “Piracy Surcharge”. This surcharge is charged by many shipping lines for entering and moving through the more dangerous waters of the world. With pirates tending to operate out of certain areas, the large shipping lines will employ armed guards on every voyage to assist them should this situation arise. This is what this charge is paying for. 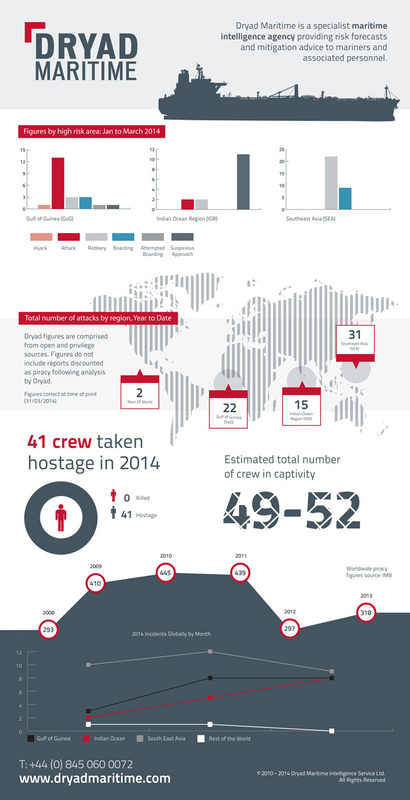 An informative infographic has been released recently (by dryadmaritime) clearly showing the number of attacks and even showing how many hostages have been taken by pirates. The waters surrounding the transhipment ports on their way to Australia are riddled with pirates, with some attacks not being reported by the ship captains. Piracy is a major problem in the maritime industry, and as you can see from the above Infographic, incidents are occurring regularly.